Hand-Mining is a method for installing a number of different pipe materials such as steel casing, reinforced concrete pipe, and reinforced concrete box segments. Hand-Mining is a labor intensive process and is typically utilized in ground conditions not condusive to auger-boring/tunneling and for shorter runs of large diameter concrete pipe/box segments. 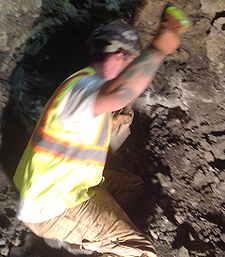 Hand-Mining can also be employed in conjunction with other trenchless construction methods in the event that occasional obstructions and/or boulders are encountered within the tunnel alignment. Steel Casing Pipe and Reinforced Concrete Pipe ranging in diameter from 36" O.D./I.D. and greater. Reinforced Concrete Box Segments ranging from 36" I.D. Distance will vary based on pipe material and ground conditions. Hand-mining is typically utilized in the following ground conditions: clays, sand & gravel, cobble, and 'soft' rock. Hand-mining is also employed for removal of large man-made or natural obstructions in otherwise suitable ground conditions. A Hand-Mining shield is fabricated at the leading edge of the steel casing or bolted to the leading edge of reinforced concrete pipe/box. The tunnel is mined and jacked-in-place simultaneously as the heading is excavated under the protection of the mining shield, so that there is no 'open excavation'. The excavated soils are transported by a haul train to the working shaft and hoisted to the surface grade for disposal off-site. Line and Grade of the tunnel is checked at regular intervals by conventional surveying instruments and manual adjustments can be made as necessary by Keefe's experienced mining personnel.